How do I sign up for the sale? ● If you've never used FlashConsign before, click on Get Started and select Become a Seller. ● Fill in the requested information, including your seller number. If you do not have a seller number, the Sale Director will assign you one once you click submit. If you don't remember your seller number, please contact sale.codirector@mothersofmultiples.com. ● Once signed up, join Kids Consignment Sale by MOMS and begin to enter items. Once your registration has been approved by the Sale Director, you will be able to print tags. ● If you don't want to sell items but you do want to volunteer, click Work a Sale. Do I need to attend a New Seller Class? ● A New Seller Class is not required, however we recommend that you watch the New Seller video on YouTube: https://www.youtube.com/watch?v=8pJwZlvpk08&feature=youtu.be. What supplies to do I need? ● Zip ties are great for securing shoes together and attaching tags to them or for attaching clothes to hangers and are recommended over safety pins, which leave holes in the fabric. ● Plastic grocery bags to label and put over your hanging clothes. ● Sharpies for labeling the grocery bags (clothing and shoe sizes as well as type of clothes) and for labeling boxes of toys, books, feeding supplies, etc. ● First, check with the MOMS Sale Team! We currently have hangers for sale. Contact the Sale Director at sale.director@mothersofmultiples.com. ● Some retail stores, such as Kohl’s, Old Navy, Outlet Stores, and Target, give them out for free if you ask. ● You can also purchase hangers at Target, Walmart, Dollar Stores, and Amazon. ● Craigslist and local buy/sell/trade forums on Facebook may have them as well. ● NO WIRE HANGERS! All children’s clothing must be on plastic child-size hangers. All maternity clothing must be on plastic adult-size hangers. ● MOMS sells tagging guns, barbs for the guns, cardstock paper, and red MOMS t-shirts. Email sale.director@mothersofmultiples.com to inquire. ● New Seller Kit $40: 1 tag gun, 40 sheets of paper, 1 bag of barbs, red MOMS tshirt (which is required for volunteers at the sale), scissors, zip ties, bags, and more! ● Blue shirts are worn by volunteers on Friday. You can wear any blue shirt you already have. ● Red shirts with MOMS logo are worn by volunteers on Saturday. These are available for purchase at the volunteer check-in table when you arrive at the sale or as part of the New Seller kit. Quality Control – what is this and how does it affect the seller? ● You cannot sell stained, torn, or unusable items. Be sure to check everything for damage (beyond light wear and tear) and stains. Quick tip: check for stains in sunlight! The lighting at the Event Center is exceptional at highlighting stains! ● You will be required to do an in-person sale training class before you can sell again. What cannot be sold at the MOMS Sale? ● March Sale: St. Patrick’s Day, Easter, Fourth of July, etc. ● August Sale: Halloween, Thanksgiving, Christmas, Valentine's Day, etc. ● Snow coats and pants are only sold in the August sale because they take up a lot of space. ● Costumes can be sold in both sales as they can be used as dress up play clothes all year long. ● Swimsuits can be sold in both sales since people take vacations all year. ● All other clothes and shoes are good for either sale! ● Battery operated toys such as LeapFrog Violet/Scout, Dream Lite, or similar items are allowed. ● No car seat carriers without bases. Extra bases may be sold separately but not carriers. What clothing items are in separate areas/racks? ● Costumes - we have this section in both March and August sales. Kids play dress up all year! The nicer and pricier costumes sell better in the August sale for Halloween. ● Dress clothes - you decide if you want them sold in the dressy section or in the general clothing section. Please mark your bags accordingly with either “dressy” or with gender and size to be put with general clothing. Quick tip: holiday dress clothes sell really well! ● Sleepwear - PJs and sleep sacks on hangers go here. ● Dance and Gymnastics wear - Please hang these items. ● This rack is only up during MOMS member shopping times. Hang your items as if they were selling separately... do NOT rubber band them together unless they are priced together as a set with one tag (see next bullet point). When you bag the items, label the bag with size and “twin/triplet set” to get them on the correct rack. ● Right before the sale is opened to the public, we move the items from the twinsets rack to the appropriate clothing area to be sold as individual items. This is why it is best to tag them separately and not rubber band the sets together. How do I attach pants to a hanger if I don't have any pants hangers? ● Zip ties that are on a hanger will work by looping through the hanger and the belt loop of the pants. Quick tip: zip tie the waist of the pants to the upper angled part of the hanger, not the bottom horizontal part. This prevents the pants from sliding around on the hanger and keeps them looking nice, which helps sell. ● As a last resort use safety pins in place of zip ties. How should items be priced? 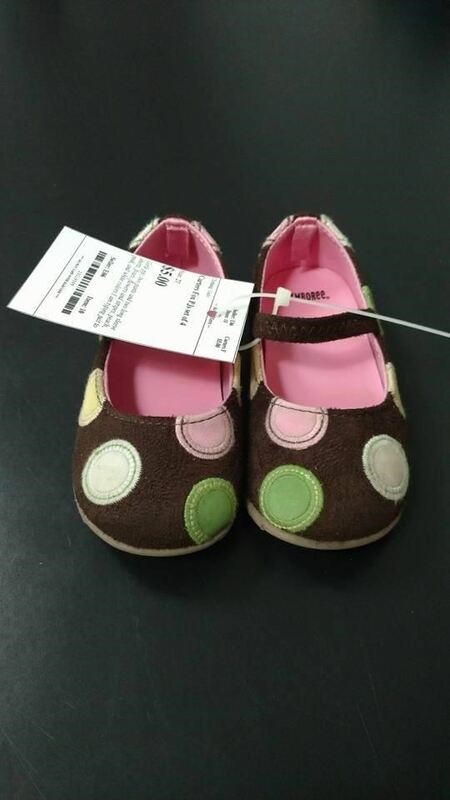 ● Kids Consignment Sale by MOMS advertises that everything is 50-90% off of retail prices. Pricing is up to you. Quick tip: the more reasonably you price your items, the more likely they are to sell. ● Tag in a seam. Best place is where the two seams meet in the underarm. 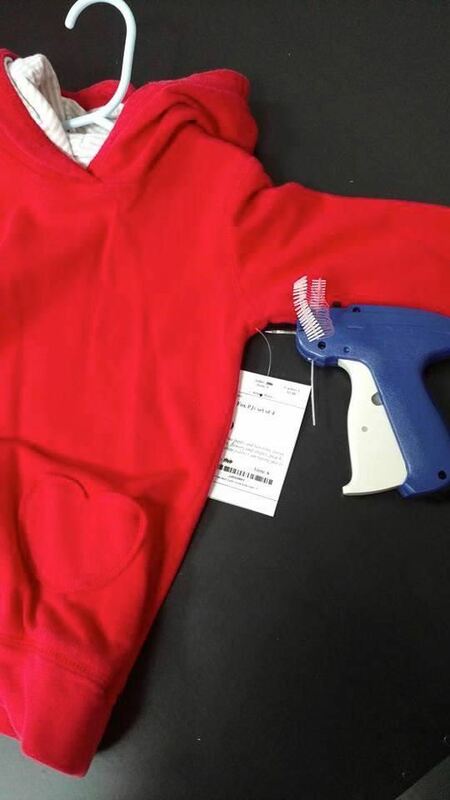 Poking the tag gun through a seam causes no holes to the clothing. ● On the waistband in the side seam. The left side of the pants are what the buyer sees on the rack so this is the side you should tag. Left side of pants wearer, right side if you are looking at the pants. ● Quick tip: bring extra tags for items with lower price points when you come to volunteer. 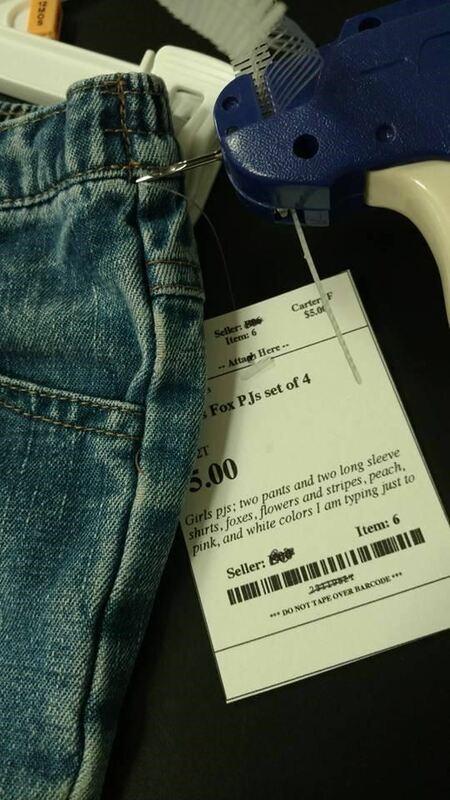 If your item or items haven’t sold, you can mark them down by giving them a new tag with a different price. You MAY NOT do this while working your volunteer shift, so plan ahead and arrive early. How are shoes kept together and tagged? ● Zip ties are very helpful for both keeping shoes together. Put the zip tie through a lace hole or a shoe strap and punching a hole in the tag to put the zip tie through. Then slide the zip tie together. ● Do not put shoes in a ziploc bag. The buyers like to look at the condition of the shoes from all angles and a ziploc makes this difficult. Also, if you washed your shoes and didn’t let them dry for an appropriate amount of time mold WILL grow in the shoe while in the bag. ● If you are worried the tag might fall off, put another tag inside the shoe and mark that tag as “duplicate”. ● Would you like to sell your items but don’t want to tag everything yourself? MOMS offers VIP tagging! We will do it for you! You can email VIP@mothersofmultiples.com for information on where to take your items. How Do I Drop Off Items at the Sale? ● When you arrive at the fairgrounds, go to the right/east side of the Event Center Building and head toward the back. MOMS volunteers will help direct you to the loading dock where your items will be unloaded. Sellers should NOT help unload their own car. Volunteers check quality as they unload and if something is not acceptable it will NOT enter the building. You will be notified and given the opportunity to remedy by cleaning it, etc. ● Please let the volunteers know what items are not to be taken out of the car, such as car seats or a wagon to be used for shopping. ● Have your puzzle/game form and car seat sale form filled out BEFORE you come to sale drop off. You can find these forms here: https://mothersofmultiples.com/page-18149. ● All sellers are REQUIRED to help sort unsold items! This helps us get done as quickly as possible and get everyone out and on their way. Please show up at 2:30PM to help sort. Unsold items can be picked up and taken off the sales floor at 4:00 p.m.
● All items are sorted by seller number and laid on the floor. Bring a box or wagon to put your unsold items in and leave that by your seller number at the beginning of sorting. ● Once sorting is finished, everyone must look through their items to make sure they only have their own items. Return anything that isn't yours to the appropriate seller number. If you would like to donate items at this time, you are welcome to do so. ● Check the quality control and lost and found area for your items as well. ● We will check everyone out as they are leaving the building. ● You can have someone else pick up your unsold items but you must notify the Sale Director in advance, sale.director@mothersofmultiples.com. ● All items left after 4:00PM will be donated. ● What does each job do? How physical is it? All information can be found on both FlashConsign under jobs. ● When can we sign up? Job signup begins approximately one month prior to the sale. ○ Friends and/or family of MOMS members may volunteer for a shift and count toward that MOMS member's volunteer hours. ○ Sign up under your account and in the “sign up notes” state their full name. ● What to wear while volunteering? ○ Friday - wear a blue shirt. It can be any shade of blue shirt you own. ○ Saturday - wear a red MOMS Sale shirt. These can be purchased for $10 each at the volunteer check-in table at the sale. ○ Wear comfortable, closed-toe shoes. ● Where to park while volunteering on Saturday? ○ Park on the left or right side of the building to ensure prime parking spots are available for shoppers. ● Which door to enter at the sale? ○ The far-right main front door, which is also the accessible entrance, facing the large parking lot. The volunteer check-in area is in the back of the hall under the MOMS tent. DO NOT come in the back loading doors (where you dropped off items). ● Training for the job? ○ When you check-in for your shift with your Lead, they can answer any questions you have about your volunteer position. ■ Please watch the training video on FlashConsign prior to the sale. ■ There will be a cashier training at approximately 6pm on Friday night in the cashier room. If you cannot attend that, then please show up 15 minutes before your shift for hands-on training with the Cashier Lead. ○ Contact sale.codirector@mothersofmultiples.com if you have any questions. ● Volunteers who work all three shifts on Friday will have dinner provided by MOMS in the hour before 3 shift volunteers shop.